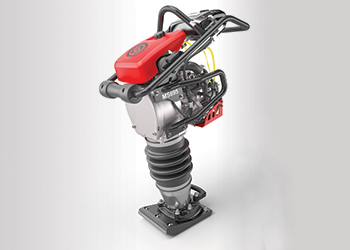 MS 695 tamper ... suited for smaller, enclosed spaces. Chicago Pneumatic (CP) has launched the new MS 595 and MS 695 tampers range to address productivity and manoeuvrability challenges in compaction tasks. The new range – its most compact and lightweight range of tampers in its 100-year history – provides users with powerful, highly manoeuvrable tampers plus the addition of a new 6-inch plate model, alongside the 9- and 11-inch models, allows for work to be carried out in smaller, more enclosed spaces, providing greater comfort and productivity. With a forward-leaning design, the MS 595 and MS 695 offer superior control of the tamper, allowing users to walk behind while the momentum carries the tamper forward. Additional features such as the easy-access control lever enable the operator to switch to idle with just one hand. The compact, slim line design make the new tampers ideal for narrow trench work with the ability to tightly move around objects. “We have designed our new tampers range to provide enhanced efficiency whilst still keeping the tried-and-tested, rugged reliability people expect from CP,” says Andrzej Mrozinski, product manager at Chicago Pneumatic. “Despite incorporating a more powerful engine, the lightweight tampers are easy to transport whilst the reduction in noise and the ergonomic design provide additional comfort and safety,” he adds. The tampers are equipped with new four-stroke Honda GXR 120 engines offering improved fuel consumption and fewer HC (hydrocarbon) and NOx (mono-nitrogen oxides) emissions. The engines offer 3.5 hp (horse power) and have been specifically designed for the new tampers range to ensure maximum power to perform in even the toughest environments. Thanks to the installation of a brand new muffler and the overhead camshaft design, noise levels have also been reduced. Chicago Pneumatic offers high-performance tools and equipment designed for an extensive range of applications. These include a wide range of pneumatic, hydraulic and petrol-driven equipment, portable compressors and generators, light towers, rig-mounted attachments, and compaction equipment for the construction and demolition industry. With a global network of distributors, Chicago Pneumatic provides customers with worldwide sales and service support.